The new Tex cafe concept offers yet another way for guests to connect with the Texas Chicken brand , with a specially curated menu of hot and cold beverages such as cappuccino , Latte , espresso , hot chocolate and more , as well as a selection of cakes and muffins . As part of the launch of the Tex Cafe , guests can enjoy the new Chocolate Chip Biscuits for a limited time . Ice cream dessert lovers can also look forward to other menu highlights such as Strawberry and Chocolate Shortcakes as well as a decadent Chocolate Volcano . Been to Segamat and looking for restaurant serve various of dishes ? Find yourself at Restoran RZ located at Jalan Utama which is near to Secret Recipe in Segamat . This restaurant are established since year 1983 . Famous with its ‘Sambal Udang Galah’ (spicy prawn) , do prepare your stomach for some delicious menus that is quite a hit here . Many variety delight dishes to be choice . When it comes to food in this area , it is imperative to imagine the deliciousness of the two dishes fish and the prawns with freshness , For those Ikan Baung Lovers , you'll be surprised and excited to try the special Ikan Baung dishes of RZ Restaurant . Since its opening in 1983 with his wife's recipes that becomes famous around the area . The restaurant have two floor , second floor is with air conditioner for any corporate lunch or any private functions . The Durian is in season again ! When mention about pungent , yellow fleshed , thorny fruit . Definitely Durian will plays in the mind and this how I'm the big fan of Durian . It's earned the title of ‘King of Fruits’ in Malaysian population and also It comes in many shapes and sizes with variety flavours . The name of the Durians are also been localised , we’ve got udang merah , musang king , Black Thorn and few more other names . - Over 40 meals offered by 13 participating F&B outlets all day long at only RM9.90nett. 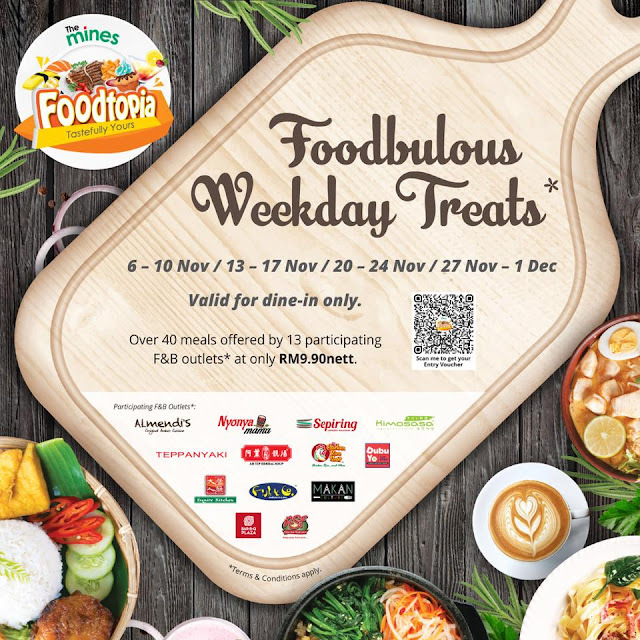 -Participating F&B outlets* :- The Chicken Rice Shop, Almendi's, Pizza San Francisco, Sepiring, Fish & Co. Malaysia, Teppanyaki Malaysia, Esquire Kitchen, DubuYo, Bar B Q Plaza, Kimosasa Vegetarian Cuisine, Makan Culture, Ah Yip Herbal Soup and Nyonya Mama. Register now to get your entry voucher here : www.foodtopiathemines.com .